Once dismissed as simply decor for college students, the minimalist look is actually based on a philosophy many find beneficial. Minimalism uses the bare essentials for modern living in a pared down and sophisticated way, preferring simplicity to ornateness and quality to abundance. While open floor plans and a lack of clutter provide the basis for this style, the ultimate goal of minimalist furniture is something more intangible: to create clean and balanced living areas that will simplify and streamline life. In a cluttered and complicated world, we sometimes need help to focus on the essentials. Create clean and balanced living areas that will simplify and streamline life. Two popular reasons for adopting this style are its affordability and philosophy. Moderate decorating budgets and limited space are common motives for embracing minimalism. Others simply find peace in the concept and enjoy keeping their homes modest and neat. Whether you admire the frugality or underlying idea of minimalist furniture design, it can change the way you look at home decor to create more functional and serene spaces. 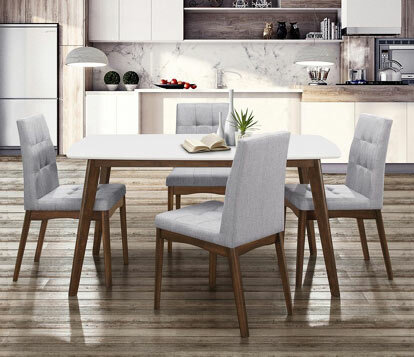 Balancing clean lines and geometric shapes with soft neutrals and natural wood are the keys to minimalist decor. This style borrows from the Japanese concept of wabi-sabi, which finds beauty in the simple contrast between perfection and imperfection. For example, a modern plastic chair with sharp, clean edges may get a cozy upgrade from a woven organic sheepskin throw. Lighting and openness are just as important as geometry and balance in minimalist design. Large amounts of natural light from bare windows shows open spaces to their best advantage. Another goal of this style is to reduce clutter. This goes for actual items around the house as well as visual noise, such as clashing colors, inharmonious angles, and obstacles to easy movement. This can give minimalist spaces the feeling of an art gallery, leaving plenty of room to admire each piece individually or focus on the people in the space rather than the objects. There are many practical benefits to using this style of interior design. Focusing on fewer items allows you to invest in quality pieces for your most important furnishings. It also significantly simplifies your floor plan, making rooms easier to move around in comfortably and more conducive to entertaining and large gatherings. In addition, with flat surfaces and less clutter, cleaning is quicker and easier than ever. Minimalist living room furniture typically includes seating, such as couches and chairs, as well as coffee or accent tables. 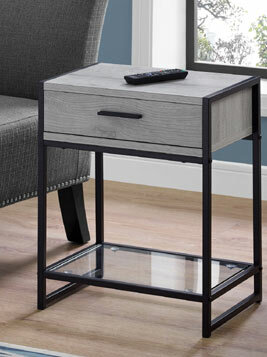 Depending on your lifestyle, a simple entertainment stand is an option, as well. Kitchens are laid out in a similar fashion, mainly featuring streamlined tables with chairs and a few small appliances on the counter. Minimalist bedroom furniture will differ from person to person, but simple beds with either a dresser or nightstand are usually standard. Those with limited closet space may opt for additional dressers and chests. 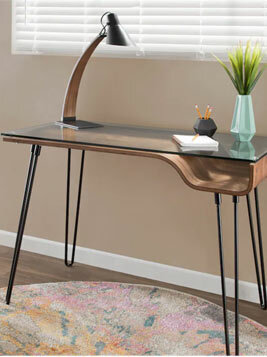 Finally, uncluttered desktops, unique desk bases, and practical shelving units are some of the most common pieces of minimalist office furniture. 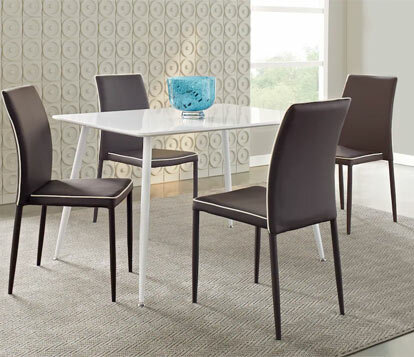 For minimalist furniture design, solid colors and subtle patterns are most common. White is a favorite color, as it helps diffuse natural light and looks clean and contemporary. Pale, neutral colors, such as beige and gray, can also be used. All of these shades bounce light around the room without distracting the eye. High quality materials, such as natural wood and metal, often have beautiful hues without any further embellishments, making them popular choices. Since complex patterns draw attention and make it more difficult to focus on furniture's overall shape and form, they generally don't work well in minimal spaces. Pastels or even bold hues can be great to offset the otherwise neutral color scheme, but should be limited to a single item or a few small accents. In minimalist decor, stand out pieces are meant to really stand out. Natural textures like glass, leather, wool, stone, and wood all add depth to your design and create a refined look. Choosing furniture with a natural grain is a great way to add visual interest to a monochromatic space, or create a feeling of luxury and quality without a lot of individual pieces. The simple addition of plants in a decorative vase can also complement a room's streamlined look without distracting from the space as a whole. Prioritizing the furniture needed to complete your design is the first step in creating this style while staying within your budget. Couches and beds are most people's first purchases, since they create a foundation upon which to build the rest of your decor. After deciding on bigger pieces, you can begin to plan for the smaller items. Chairs, coffee tables, and dressers commonly follow big ticket pieces on minimalist designers' priority lists. When you have finally chosen all of your furniture, you can proceed to the finishing touches that tie rooms together. Despite their open spaces and modern, architectural decor, minimalist homes don't have to feel like museums. They should still appear comfortable, lived-in, and warm, and adding a few well-chosen accent pieces is an easy way to do this. 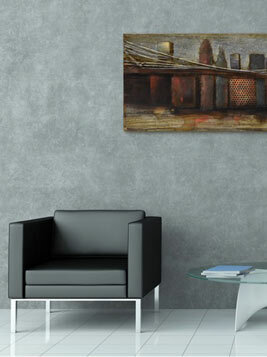 Hang some abstract art on the walls or display simple trinkets and photos to express your personality and enhance your space.